If you ever take a bulk delivery on materials, you may find yourself with several wooden pallets, and not know what to do with them beside burning them or begging the garbage man to take them away. Wikipedia suggests they can be used for a number of really clever things. Here are some not-so-clever but very easily completed projects for anyone with a hammer and nails. All of these work very well because wooden pallets are made not to come apart. Note: most inexpensive pallets are made from untreated pine or other softwood, which will ensure that the part of the pallet exposed to the ground will begin to rot soon. Rarely, you may find a pallet made from treated pine. (If you burn it, don't breathe the smoke.) 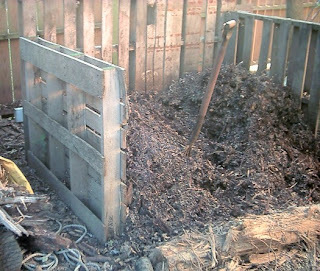 It will take a few years before the compost bin falls apart, which gives you plenty of time to find more pallets. Hardwood pallets may last longer, but are often subject to a deposit. I did it a few years ago. I had to cut one of the pallets in half for some reason, but I don't remember why. I ended up using a scrap 2x4 as a support on the back, and some masonite or fiberboard as the top. Just nail three pallets together in a 'C', with the deck boards facing in. They don't have to be vertical, but it makes the composting part work better. Nail in a couple of diagonal supports on top if it won't stay rigid. Just face the back toward the neighbors and fill. You'll never have to burn leaves or buy fertilizer again. If you have a dog, even one that mostly lives inside, using three or four pallets you can make a nice, sturdy spot for your little wolf. Lean two more pallets together on top of the first one, with the bottom edges of the top two resting between two deck boards. Nail the roof-walls together, optionally using a couple of boards to make cross-pieces at the open ends. Cover it with plywood, shingles, or any other weatherproof material so that Fido has a spot out of the rain and sun and off the ground. Throw in a piece of old carpet or welcome mat for that homey touch.